I read this book after reading "Bringing Up Bebe" and that was a big mistake. 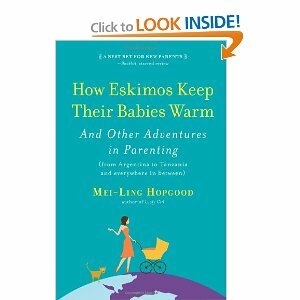 "How Do Eskimos Keep Their Babies Warm" was a good book and pretty well written but it wasn't as in-depth and personal as I was expecting. It turned out to be more of a survey of parenting styles rather than an "adventures in parenting" book like the cover describes, although she does share some anecdotes about her experiences raising her daughter. Interestingly, the author references "Bringing Up Bebe" in her chapter on French children and eating. If you're a parent looking for a lighter read, you might give this book a try. 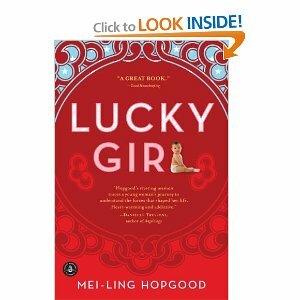 I would recommend "Lucky Girl" to other adoptive parents to read. While the heart of the story is about Mei-Ling Hopgood meeting and getting to know her birth family, the parts that have really stuck with me are the ones where she explores her feeling about being adopted and about being adopted transracially. I think part of that is my need to hear that our kids will turn out just fine (like the author did) as opposed to feeling damaged by the experience (as in "Black Baby, White Hands by Jaya John"). I also enjoyed reading about the author's experience getting to know her birth family and how they changed as people in her eyes as she came to know them better. The book had a little bit of a stilted feel to the time line but not enough to put me off reading it. I loved this book. It's actually in my purse now because I'm reading it again. As I said in my first post about these books, I read an excerpt from this book in Bon Appetit magazine several months ago and decided to give its suggestions regarding getting kids to eat, and to eat real food, a try. We stopped making special meals at special times for Sky and we no longer feed her "kid food". She eats what we eat: chili with cornbread, sushi, Thai food. Of course, we still eat pizza and fish sticks but when we do, we have them as a family. She doesn't need to eat everything on her plate but she needs to take at least one bite of everything we're having. Also, she has to stay at the table until everyone's done eating and she has to take her plate/bowl to the counter when we're cleaning up. Because she's two, we're still having to remind her about the last two, but as far as eating goes, we haven't had any problems. But I digress. I think the thing that I loved most about this book, and it's very hard to choose, is that it reminded me that I'm not just a mom. There seems to be a self-imposed expectation on American moms that you will devote all of yourself to being a mom. There's nothing wrong with that but I missed being a woman too. Thanks to this book, I'm paying attention to myself again and doing it every day, not just on date night. I've started wearing my hair down all the time, even though it takes more maintenance and I'm wearing nicer clothes and shoes, including high heels, on work days. And it's working for me. Did you notice above that I said the book was in my purse? For years, I've used a messenger bag to carry my things but I've switched to a purse and just having something feminine and pretty on my shoulder instead of something that can (and has) doubled as a diaper bag makes me feel better about myself. But I digress, again. Another great thing about this book is that it doesn't come across as judgemental or try to teach you a new parenting style. 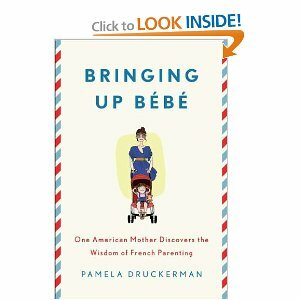 The author describes her experiences and then contrasts them with how things are done in France, among the families that she interacts with as a parent. She leaves the reader to make their own judgements. While I recognize that this book was particularly appealing to me because I'm also parenting in a foreign country, I think most parents would enjoy this book and I would recommend it to anyone looking for a good read.